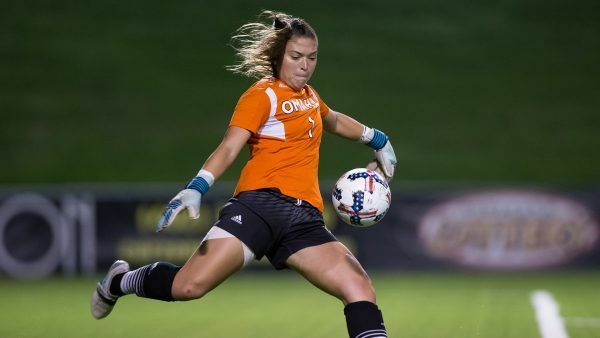 The University of Nebraska Omaha Mavericks Women’s Soccer College ID Camp is a six-hour high-level and fast-paced training program that will fall on the 10th of June. Its design is especially for female soccer players in grade 9 up to grade 12 who are interested in playing at the collegiate level. This soccer identification camp is going to take place at the state of the art Caniglia Field which is on the University of Nebraska Omaha campus. Furthermore, the camp is only offering 60 available spots. Thus, registration is on a first come first served basis. The training program focuses on enhancing the player’s technical capabilities and tactical understanding. It also aims at developing precise and fast decision-making capabilities. In addition, this soccer event will replicate a real college training and playing environment. The University of Nebraska Omaha, originally the University of Omaha, is a public, coeducational, space-grant university in Omaha, Nebraska. It is part of the University of Nebraska system and the Coalition of Urban and Metropolitan Universities (CUMU). The university is also a member of the North Central Association of Colleges and Schools and the Coalition of Urban and Metropolitan Universities. In addition, the University of Nebraska Omaha is in the doctoral/research university classification according to the Carnegie Classification of Institutions of Higher Education. The University of Nebraska Omaha is using a semester-based academic calendar. Currently, its total undergraduate student population is 12,536. 48 percent of this undergraduate student population are male students and 52 percent are female students. This undergraduate student population is also through a selective enrollment acceptance rate of 86 percent. Correspondingly, the University of Nebraska Omaha’s student to faculty ratio is 17:1. The university is also serving around 3,000 postgraduate students. In athletics, the University of Nebraska Omaha is mainly competing in the Summit League of the National Collegiate Athletic Association (NCAA) Division I. The nickname of its athletes is Mavericks. Meanwhile, black and crimson are its identity colors. Their mascot’s name is Durango. The head coach of the University of Nebraska Omaha Mavericks women’s soccer team is Tim Walters, a native of St. Louis, Missouri. He is now entering his second season at the helm of the Mavericks women’s soccer program. Coach Tim Walters is a bachelor’s degree in management information systems graduate from Creighton University. He is the former University of New Orleans assistant coach. Additionally, Coach Walters also has coaching experience at Rollins College and Creighton University. He is also a former top-caliber college soccer player. In fact, he is the 2007 Saint Louis Nike Classic Tournament Co-MVP awardee. Then, the University of Nebraska Omaha Mavericks women’s soccer assistant coaches are Kelly Farrell and Nick Miller. Coach Kelly Farrell, a native of Oceanside, New York is now in her second season with the coaching staff. Coach Kelly Farrell is a bachelor’s degree in communications graduate from Loyola University Maryland. She was also the former Loyola Greyhounds director of soccer operations. Coach Kelly Farrell is a United States Soccer Federation (USSF) “B” coaching license holder. And finally, Ava Doetsch is the Mavericks women’s soccer graduate assistant coach. The University of Nebraska Omaha Mavericks Women's Soccer College ID Camp is set to run from 10:00 AM until 4:00 PM on the 10th of June. Its venue is the state of the art Caniglia Field, the home field of the University of Nebraska Omaha Mavericks women's soccer team. This event is ideal for those who aspire to play at the college level.